I think the thing I like most about Brooklyn Brewery is the balance their beers always display. Even in their hoppiest Pale Ales or richest Imperial Stouts there is always an effort to make a quality, balanced, complete beer. There is always lots going on in Brooklyn beers, but they have a poise and completeness that makes the beers drinkable, no-matter the strength. But this beer, A Wee Bit, isn't the work of Brooklyn alone, it's a collaboration between Brooklyn Brewery and Williams Brothers Brew Co in Scotland – and it’s an absolute masterclass in drinkability. 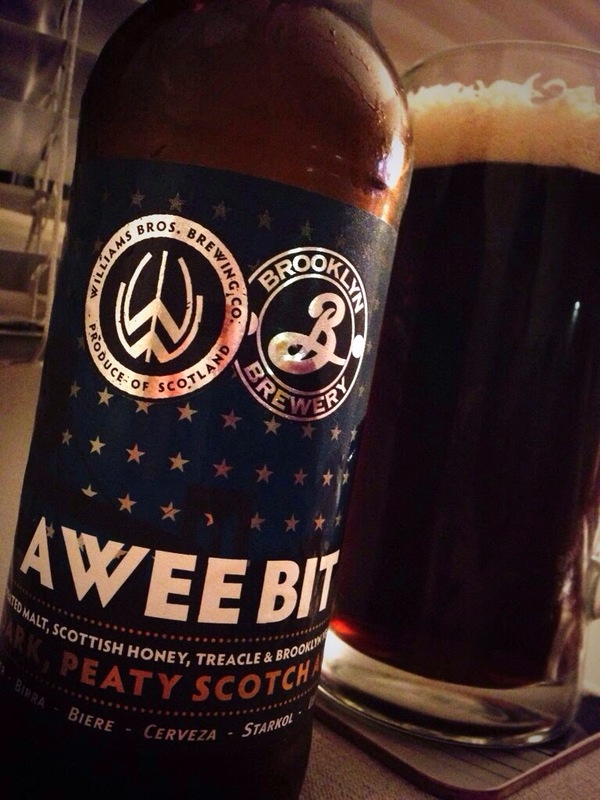 Trust me, it takes a very steady hand to create a gluggable Scotch Ale brewed with peated malt, treacle and honey. It’s a beer that could so easily have ended up a sticky, overly sweet mess, or even worse something which has far too much peat and medicinal character – evoking thoughts of childhood scraped knees and the painful sting of TCP that followed. But in the hands of the Williams Bros, with a little help from those magicians at Brooklyn, it has turned out as one of the most surprisingly drinkable beers I’ve enjoyed in quite some time. Like a sort of Scottish Schlenkerla Marzen, albeit not as powerfully smoked. The initial aroma is that of BIG smokey-sweet frankfurter and woodsmoke with just a little touch of honey dipped pine needle. The flavour is smooth and flavoursome with a nice smoked marzen like quality and only a touch of sweetness. There’s a lovely underlying roasted malt bitterness that combines well with a clear but restrained peated malt earthiness. The peat is quite subtle but it's certainly there, something which Scotch whiskey drinkers will no-doubt be able to pinpoint much easier. The honey and treacle don't really come through, but for me that’s not really a negative. I was surprised how much I liked this beer. Which, as you may have guessed, was a lot. p.s. I was supposed to be reviewing this beer as part of a live tweet-along the brewery held last week, but as usual I was disorganised and unavailable. So my review of this and two other new beers will be coming in three separate parts. i ordered this from alesela, bottle in garage for the weekend. unfortunately my paradigm shift got killed by heavy handed delivery chaps. looking forward to it though! It really is an absolute cracker of a beer. I'd seriously consider adding it to the regular line-up if I were Williams Bros.
Would love to try this on cask too.